It's a new year, and a new year means new cloud computing trends. Cloud computing, which is the use of an online network to store, manage, and process data, is becoming more popular than ever. Clouds aren't gaining exposure solely in the digital marketing world either -- this technology can be found in basically every industry. To stay up to date with cloud computing solutions, here are some cloud services trends to keep an eye on in 2017. For a business to be successful in 2017 it has to have a great product or service, hardworking employees, and a strong emphasis on technology. Because technology is so vital to the success of business, IT consulting is more important than ever. IT support companies are available for businesses that want to improve many aspects of their company that pertain to technology. Here are a few important reasons why you should work with professional IT support companies. It's easy for anyone to be connected via mobile applications. 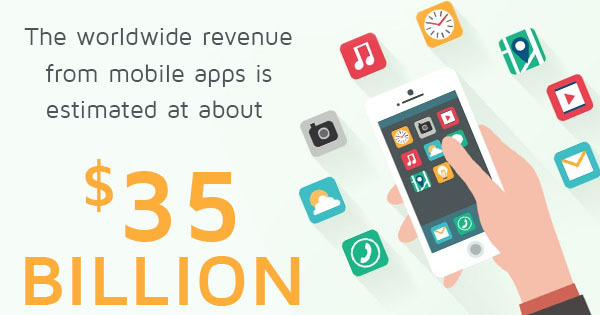 The worldwide revenue from these apps is estimated at about $35 billion, and this is including the ever-popular social media sites Facebook, Twitter, Instagram, and LinkedIn, to name a few. Social media is often seen as a casual tool for staying connected, but in reality it's crucial to building a professional web presence online. When used correctly, Search engine optimization and social media can be an incredible and helpful tool. Here's how. The number of followers you have greatly impacts your rankings. The more people who click on your website, the better! Plus small businesses have a little bit more of an advantage compared to mullion-dollar corporations in that Google can determine the quality of your followers. Even though quantity is not always the best when it comes to followers, it is incredibly easy to build your follower base with social media. By posting relevant articles, helpful tips, and open inquiries, you will soon have an interactive following which will share your information and help build your authority for potentially new followers. Social media encourages clicks to your website, which will diversify the backlinks you already have. Think of your social media accounts as a broadcast network, and the more viewers you have, the better! Your end goal is to improve your social reputation, which will in turn help you rank better within Google's algorithms as they will look for more authoritative websites. Because you are a small business owner, it is important to think of your SEO solutions. What do you want to gain by investing in an SEO company and IT support? One SEO detail you need to focus on is local visibility, as you will want to attract viewers in your general location! Social media provides the perfect opportunity to engage your business within the local community, and by making updates whenever you are doing something in your town your viewers will be able to see it. After a while, this will go a long way in terms of boosting your local search engine optimization and more clients will come knocking at your door. Looking to invest in search engine optimization services for your small business? Contact our specialists today! Consider this -- one-fifth of all the malware that has ever existed was created in 2013. Worse, the rate of new malware development has only grown, meaning that it is more important than ever to protect yourself while using the Internet. As cloud computing services become more and more available, cloud based networks are growing in popularity thanks to their ease of access and ability to store anything and everything. To protect yourself when using cloud services, follow these simple tips. First and foremost, make sure you understand the what cloud providers do. In simple terms, the cloud is an application that allows you to store files from anywhere and everywhere. Since it doesn't exist via a physical device, you can use any tablet, smartphone, or computer to access your files. Most individuals choose to use the cloud because of its storage capacity and its ease of access. However, these cloud services aren't always the most secure, which is why you should be vigilant whenever you upload information. As mentioned before, there are plenty of cloud computing solutions available to use. However, it is important to do your research so you know exactly what you are signing up for. Does your cloud automatically encrypt your files? Do they provide information to the government if requested? Do they own their servers or do they rent from another company? While some users may choose a lapse in security for convenience, make sure you are fully knowledgeable before you sign up. While this may seem obvious, it is often overlooked. Make sure your passwords for each cloud application differ and be sure to include a special character, an upper case letter, and a number. The best passwords are almost impossible to guess, and most importantly, make sure they go through a two-step verification system in case they are guessed incorrectly. If you are not specifically using an application that encrypts your files, you should consider doing them yourself. This way, you will have another added level of protection in case a hacker gains access to your information. There is no such thing as too much protection when it comes to using your cloud services online. If you have any questions or are concerned about your security online, contact our IT services professionals today. It is no secret that we live in a technology-filled world. But with these technological innovations comes a higher risk for cyber crime and data breeches. 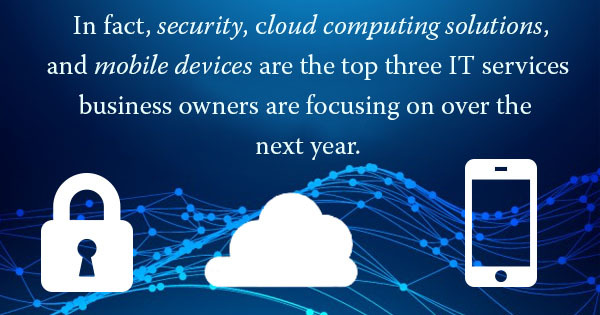 In fact, security, cloud computing solutions, and mobile devices are the top three IT services business owners are focusing on over the next year. However, the new year is just around the corner and with that in mind here are some security trends that are set to take over in 2017. IOT non-human devices with weaker security will increase as they are being used more and more in drones and botnets. While there is no easy fix for this problem as there are just too many weak security options on the market, experts are hoping the owners of these technologies will follow simple instructions, such as using complex passwords and keeping up with vendor updates to protect themselves and their sensitive information. Gone are the days where a single virus would ruin one computer at a time. Cyber hackers are becoming more and more adept at carrying out larger attacks, so ransomware is on the rise. These virus strains are so powerful that they can wipe out all the information on thousands of computers at a time. Whats worse is that the majority of these strains are undetectable and cannot be prevented until it is too late. Unfortunately, human error is a huge security risk. Lack of training and proper precautions can compromise entire systems, including all of a company's important data. In order to prevent this, business owners can invest in anti-virus and backup solutions, while providing adequate training for all employees. Or, if that is too difficult, consider placing limits on who will have access to the important data. 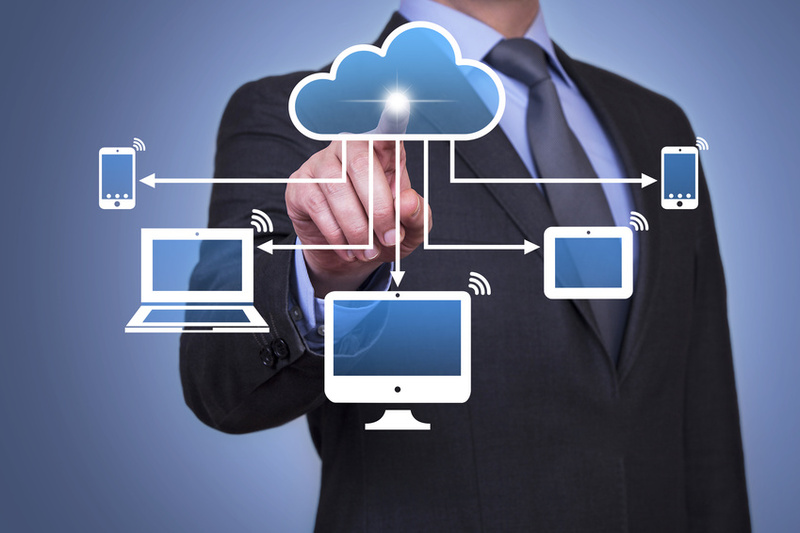 In order to prevent the unexpected, it is important to utilize network consulting services and choose the right cloud computing solutions for your business. IT consulting will provide you with the right cloud services, so you never have to worry about losing important data or putting your client's information at risk. If you are interested in finding out how cloud computing solutions can help to secure the infrastructure of your business, contact the professionals at MVP today.